When 'The End is Not the End' was released way back in 2008, it blew up all over the Internet, when I went on holiday to Memphis last October, I would constantly hear the lead single, 'If', being played on the radio or the album would being played full blast in some one's car. They became the band who were everyone's little secret. With 'House of Heroes Meets the Beatles', they delved into their influences a lot more and explored a different style of music that they weren't used to and it's clear that on the first few listens to 'Suburba', they have broken off comparisons to associated acts and tour buddies such as Skillet, Family Force 5 and Relient K and have become something so much more than just a simple rock band. 'Relentless' kick starts this album and sounds so much like Queen and is pretty much the song to dust off your air guitar for. The first single from the album 'Elevator' sounds as if it were the midpoint between 'The End Is Not The End' and could easily be played on radio and music video stations and not feel out of place alongside other mainstream bands. The opening to 'So Far Away' is very reminiscent to that of King Of Leon's 'Use Somebody', but thankfully doesn't feature the same overplayed feeling and remains in tune. It astounds me sometimes how people can write such brilliant songs, with only few chords at their disposal. Truth be told, after listening to the introduction to 'God Save the Foolish Kings', you feel overwhelmed, as they've managed to create a huge sound that you couldn't find on any recent albums, which would cost millions and would take years and years to achieve and they've done it on an indie label in the little space of less than two years. After the wall of sound inspired 'God Save the Foolish Kings', it's time for a break. 'Salt in the Sea' is the perfect follow up to this and is pretty much a straight up love ballad, where lead singer and future teen heart-throb, Tim Skipper, whispers during the middle eight 'Until I become one with the salt in the sea / I will stand up straight and let you roll into me'. One for the lovers out there. Anyone got a lighter? 'Somebody Knows' could have easily have been from The Beatles' 'Let it Be' and the introduction actually reminds me a lot of 'I've Got A Feeling' from the aforementioned album. 'Dissapear'is perhaps the darkest song on the album and in a way counters the entire optimistic and powerful mood portrayed on the album and contradicts it. The second proposed single from the album, 'Constant' is pretty much another ballad for the lovers and a strong single. Despite all of this we make our way to the final track, 'Burn It Down', after listening to the entire album in it's entirity several times, I still feel as if this isn't as strong of a closing song, as 'The Young and Brutal' (from 'The End is Not The End') and in my opinion should have been switched with 'Salt in the Sea' or 'Constant 1' and alternatively this song could fit nicely in the middle somewhere. The song itself doesn't strike me as epic enough to close off such a brilliant album, created by such a brilliant band but at the same time. It doesn't lower my opinion of the album and still regards it as one of the best of this year. All these comparisons i'm making aren't necessarily a bad thing, House of Heroes are drawing inspiration from bands who don't often get credited and are extremely underrated. In a sense they aren't being unique but at the same time, in this day and age, they are. It's clear that with 'Suburba', House of Heroes could easily take on arenas and stadiums and have their songs shouted back to them, it's time for us to let go of our little secrets and let them become successful. Many thought that 'The End is not The End' was it, they would never produce anything to top that. They have, the question is, will they do it again? and will we get another Beatles covers EP? Pretty Please. 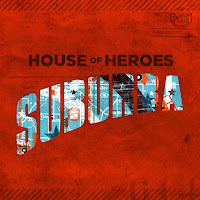 'Suburba' by House of Hereos is released on August 3rd through Gotee Records. House of Heroes on MySpace and Twitter.